Dental Hygienists' Alliance Offers Tips On How to Prevent Childhood Tooth Decay - the Number One Childhood Disease. The Dental Hygienists' Alliance suggests utilizing the dental hygienist in alternative treatment settings such as a pediatrician offices and schools could make a difference in preventing the number one childhood disease. Registered Dental Hygienists can help save lives. When not limited by state practice acts limiting opportunities for outreach, the dental hygienist is able to expand prevention beyond employment in a private dental practice setting. Earlier this year, a 14 month old toddler tragically died during dental treatment for cavities. The investigation is ongoing, and as of yet there are no answers as to what went wrong during the procedure thus leading to Daisy’s death. While trying not to minimize this tragedy, it points to another tragedy. In this day and age of preventive dental knowledge, why are children still experiencing decay thus requiring dental procedures under sedation? Children as young as Daisy do not need to experience dental decay. We know what causes this disease and how to prevent it, yet many children lack access to preventive oral care. There is not a lack of dental professionals educated and willing to address this shortfall, however, stringent and unnecessary restrictions prevent delivery of services where they are needed most. Early Childhood Caries (ECC) is defined as “the presence of one or more decayed, missing or filled tooth surfaces in any primary tooth in a child 71 months of age or younger.” Statistics vary with study and location, however in the United States more than a quarter of children in this age group experience decay, and the numbers rising and many diseased teeth remaining untreated. Parents erroneously think that early teeth are “just baby teeth” and not of importance. There may be major access to care issues (financial, location). Left untreated, the decay will progress to more complex and dangerous health problems including pain and life threatening infection, stress, and even diminished growth. A child with ECC is more likely to develop decay in permanent teeth. In the United States, the cost of treatment of Early Childhood Caries reached 1.55 billion in 2010. Shirley Gutkowski, RDH, BSDH, whose practice is focused on Orofacial Myofunctional Therapy, offers the following tips for parents/caregivers to reduce or eliminate ECC. 1. Limit sodas to once a day on one occasion. The amount is not as important as the number of times the child sips the soda. 2. Chew gum made primarily with xylitol, a natural sweetener, for a total of an hour a day starting at age 4. You’ll have to be with the child while they chew, at least be in the same room. 3. Never buy processed vegetables for any age child. At the very least steam them to maintain structure, chewing is very important in preventing decay as well as other oral issues. 4. For small children, check under the upper lip every Friday afternoon. That’s the most important place that early childhood decay shows up. There are structural effects of a lip tie that makes it easier for the teeth to decay so checking it often is key, the decay goes really fast. It starts out white, changes to brighter white, then a yellow brown. 5. Make sure the child doesn’t sleep with their mouth open. Make sure they breathe through their nose all day. If they can’t, find out why. Mouth breathing upsets the acid/base balance in the blood and the saliva. Acidic saliva will make kids teeth decay no matter how much they brush or how much fluoride they use. With the recent development of Caries Management By Risk Assessment (CAMBRA), fluoride varnishes, and early treatment with silver diamine therapy, how can we expand education and prevention of early childhood caries thus preventing tragedy as well as reduce the expense of treating this disease? Oral health care should begin in the perinatal period! As many young children have medical care access but not yet a dental home, it makes sense that the medical community and dental community cooperate to provide early prevention and early treatment in a facility designated as a patient centered health home encompassing dental evaluation and prevention at well-baby check ups. The dental hygienist, with expansive education emphasizing preventive strategies of daily oral care, alteration of oral flora, nutrition and other factors associated with the disease of caries, caries remineralization and early treatment, would be the ideal candidate to step forward for employment in health care facilities beyond the dental office. 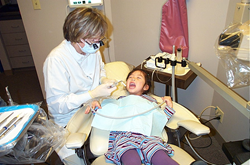 If allowed to see patients at times and places that are convenient to the patient, dental hygienists could assess patient oral health, level of home care and diet, and easily apply fluoride varnish or provide treatment of initial caries with silver diamine fluoride or other non surgical treatment, and offer education for reduction or elimination of future disease of caries through Caries Management By Risk Assessment When not limited by state practice acts limiting opportunities for outreach, the dental hygienist is able to expand prevention beyond employment in a private dental practice setting. The Dental Hygienists' Alliance strongly believes the hygienist should be employed in pre-natal clinic settings to educate expectant mothers in optimum oral hygiene, aiding in prevention of infecting their baby’s oral cavity with high risk caries pathogens as well as reduction in pregnancy complications due to periodontal disease. Hygienist employed by pediatricians could offer oral hygiene instruction, motivational interviewing, nutrition and other preventive dental practices to children and parents through development as well as early evaluation and referral for oral disease. Early Childhood Caries is preventable and the Registered Dental Hygienist is the answer to eradicating the disease.Children do not need to suffer health problems due to Early Childhood Caries any longer. Ask for a dental hygienist to address your preventive dental needs and questions, no matter the health setting. Your influence can make a difference in the health of future generations.